Mobile computing has greatly increased in popularity over the past several years, due largely to advances in miniaturization. Today we can get in a notebook PC or even a hand-held computer the power that once required a hulking behemoth of a machine. We also have wireless LAN technologies that easily let a device move from place to place and retain networking connectivity at the data link layer. Unfortunately, the Internet Protocol was developed back in the era of the behemoths, and isn't designed to deal gracefully with computers that move around. To understand why IP doesn't work well in a mobile environment, we must take a look back at how IP addressing and routing function. If you've read any of the materials in this Guide on IP addressingand I certainly hope that you haveyou know that IP addresses are fundamentally divided into two portions: a network identifier (network ID) and a host identifier (host ID). The network ID specifies which network a host is on, and the host ID uniquely specifies hosts within a network. This structure is fundamental to datagram routing, because devices use the network ID portion of the destination address of a datagram to determine if the recipient is on a local network or a remote one, and routers use it to determine how to route the datagram. This is a great system, but it has one critical flaw: the IP address is tied tightly to the network where the device is located. Most devices never (or at least rarely) change their attachment point to the network, so this is not a problem, but it is certainly an issue for a mobile device. When the mobile device travels away from its home location, the system of routing based on IP address breaks. This is illustrated in Figure 127. 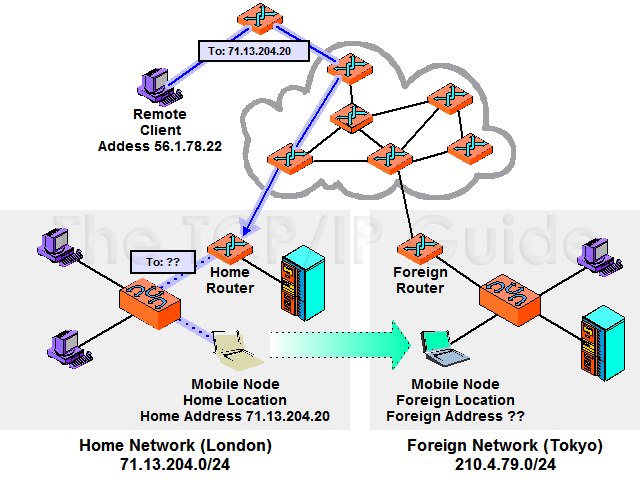 In this example, a mobile device (the notebook PC) has been moved from its home network in London to another network in Tokyo. A remote client (upper left) decides to send a datagram to the mobile device. However, it has no idea the device has moved. Since it sends using the mobile nodes home address, 71.13.204.20, its request is routed to the router responsible for that network, which is in London. Of course the mobile device isnt there, so the router cant deliver it. Mobile IP solves this problem by giving mobile devices and routers the capability to forward datagrams from one location to another.